Review: When Akira Senju is scoring any anime, it’s not unreasonable to expect nothing short of greatness, but that’s unfortunate baggage to be carrying around when he does finally stumble. His previous works, from Arete Hime to the fantastic Red Garden soundtrack have shown us just how good he is at writing music that brings out not only that upwelling of emotion associated with loneliness and suffering that the characters experience, but also the wellspring of hope that the characters draw from to see them through to the very end. With such lofty expectations, it’s a matter of time before he’d let us down. 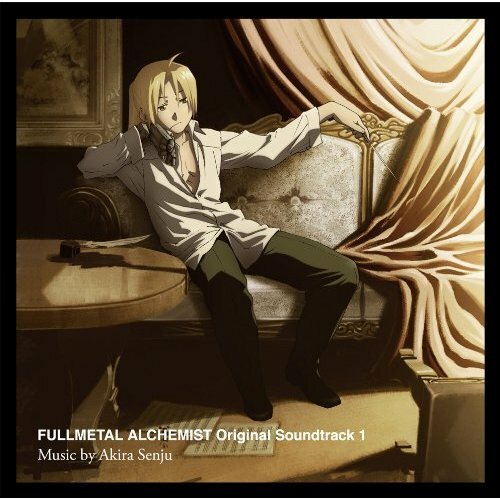 Fullmetal Alchemist: Brotherhood’s soundtrack is that letdown. It’s far from a fall from grace, but it’s riddled with enough inconsistencies to raise a few questions. Was the sheer immensity and scope of the project just too much? He’s done a quality job for the 51-episode Victory Gundam series which also featured a three-disc soundtrack, so that can’t be it. Perhaps he’s just going through a phase where his creativity isn’t as high. Whatever the reasons are, FMA:B should have been a good fit with Senju’s compositional style since the show’s plot centering upon the physical and emotional trials and tribulations that Edward and Alfonse Elric must undergo isn’t unlike that of Red Garden’s, and yet, Senju doesn’t draw out those poignant emotions as well as he normally does. The pieces featured early on carry the hope that once again, Senju will deliver a memorable score. “Main Theme ~The Fullmetal Alchemist~” opens up with an ominous tone, depicting the extent of the monumental struggles that the Elric brothers will face throughout their journey. The orchestra builds its tension slowly, and once it hits its peak, the chorus takes over with the orchestra in accompaniment and together, they bring a sound that mixes in both majesty and sadness in showing a long road, filled with little reprieve from tragedy and suffering, that will take the brothers to hell and back. “Laws of Alchemy” follows that with a rigid-sounding violin melody that highlights the unforgiving nature of alchemy and the horror inherent in its backlash should anyone cross that forbidden line. It’s a strong start, and because of that, you’re not quite prepared for the drop in quality when it materializes. Starting around “Fire in the Sky,” Akira Senju moves away from the distinct melodies that characterize his past works and aims towards building ambiance. While it works well in context, I find my attention wandering rather than focusing upon the music without the visuals to accompany them. Tracks like “Mist” bore me out of my mind because it repeats a bland melody that fails to grab my attention in any way. The same goes for “Fifth Laboratory,” which heaves in the bombast and crescendos it further without tossing in much variety to keep the listener interested. “Fanfare for the Brave” takes on a different form of badness because initially, its melody inspires, but as it keeps on progressing towards glory and redemption, it becomes painfully evident that the piece intends to leave us hanging by not delivering any sort of payoff at the end that would clinch it all and leave us in awe. Scattered amidst the ambient doom and gloom are a few delightful tracks like the “Far East Suite” which bring out the scope of FMA:B’s epic odyssey similar to the feeling evoked in Joe Hisaishi’s Princess Mononoke score. “Home -en route to Resembool-” is jaunty and happy while “Home -a house on the hill-” is warm and nostalgic even if a subtle hint of sadness lies underneath it all. Together, their mellow melodies provide a welcome break from all the tension that’s built up through the other tracks. And as the soundtrack winds down, “Overture -Brotherhood-‘s” poignant melody gives us a peace of mind with the hope that at the end of the odyssey, the two brothers will find the happiness that they have sought all along, making this track a strong closer. Depending on how you look at it, this letdown could be seen as a positive because even amidst the boring ambiance, Akira Senju still manages to draw forth a handful of tracks that are as good as the ones he’s composed in the past or a negative in that this album on the whole is so inconsistent in comparison, making it difficult to sit for the whole way through. My mindset definitely falls into the latter category, and so, I hope that FMA:B marks the bottom in the spectrum of Senju’s compositions. Wow, “Fanfare for the Brave” had me waiting for a climax that never came. The OST makes for decent studying/reading music I guess. almost everything is going to fall short if the basis of comparison is Red Garden’s OST, no? In this soundtrack he’s fallen into the trap so many others have fallen into before him; there are only so many action pieces you can write before they all start sounding the same. Do you think that a more ambient piece is more versatile? FMA is most certainly a longer than average series. With (limited? there’s three soundtracks.) amounts of music, maybe they wanted ambiance. Hm. An issue with Senju’s style that I see again in this soundtrack, is that I feel like he’s constantly got something making harmonizing noise in the background. Silence can be used to good effect too, especially to let the music take a “breath”. That was the major problem I had with his work with Red Garden which contained plenty of incessant harmonizing string. That being said, he’s still one of my favorite composers. He actually specializes in scoring TV dramas, or at least he used to. Isn’t it? I first thought, “hey, this sounds kind of inspiring” except I was slightly afraid of it not pulling through and really became afraid when I was 15 seconds away from the end as the fears were realized. Yeah, it’s not standout music in the least. He’s done much much better. In this case, I’m not sure it’s action pieces as much as pieces that tense up and announce the arrival of doooooooooom. There’s a lot of it in this soundtrack and I just wasn’t able to focus on any of them because there wasn’t anything to grab onto musically. There’s a possibility that the people who produced the show wanted ambiance, and unfortunately, I can’t read the liner notes to see what was going through his mind. It could very well be that ambiance can translate to more situations so that the music can be used over and over, which reduces the workload. But still, 3 discs worth of music… you’d think there’s enough room for diverse, engaging stuff. I’ve never noticed that tendency of his while I’m listening and if you were to ask me to name a composer who could use some more silences, I’d plop down Hiroyuki Sawano. Anyhow, this soundtrack doesn’t diminish Senju standing since he’s got a fairly solid track record. I’d worry if his next work falters to this level. I do believe you’re right on the TV dramas bit. Quite a few anime composers switch between dramas and anime. I know the guy who composed Nadesico and Taisho Yakyuu Musume has done quite a few. I was wondering if you’d get to this one. A BIG issue with Brotherhood’s music implementation is that there are many tracks used over and over and over and over and OVER. “Mortal Sin”, “Clash of the Alchemists”, “Lurking”, and yes, “Fifth Laboratory” were all played over twenty times at least over the course of the 64-episode series. And they weren’t used that well. The director uses Senju’s score like a sledgehammer, like it is full of bombast when Senju clearly went for a more atmospheric, subtle approach. Notably, “Clash of the Alchemists”, an action/fighting track, was used in a scene that had ZERO action in it, and “Mortal Sin” was used for . . . dramatic book-reading. I like atmospheric music so this soundtrack was actually enjoyable to me. Believe it or not, I like “Mist” a lot, though it may be because the director didn’t spam that track into oblivion like he did others. OSTs 2 and 3 are improvements over OST 1, but OST 2 and 3 also contain far less contributions from the Warsaw Philharmonic Orchestra even though they still retain primary credit. OST 3 in particular marginalizes the Warsaw compositions which makes me think they ran out of budget late. However, OST 2 and 3’s non-Warsaw compositions are done by the same hodgepodge group of musicians that handled Red Garden’s masterpiece of a score, so the non-Warsaw tracks still sound great. Brotherhood’s scores, however, make for good reading/studying/writing music. In that aspect, they have value, in an odd way. Overture -Brotherhood- is my favorite among the tracks. Overall, I didn’t think this soundtrack is that bad. It’s kind of nice. Ouch… pulling up the notes I wrote for those, yeah… they weren’t exactly sparkling with awesome that I’d care to hear it over and over. Especially when the director does what you said he did. It’s kind of funny that the combination of the series following the manga + Senju in the composer’s chair should have made this series a sure winner, but I ended dropping it 7 episodes in because I couldn’t stomach the random humor that detracted from the serious situations. One of my reviewing colleagues on another site also remarked how this rendition of the story didn’t possess the atmosphere of the first season, and I suppose that’s the director’s musical decisions plays a part there as well. I’ve been listening to OST 2 for the last few days, and so far, it’s better, but I’m reluctant to say that it’s much much better (listened to OST 2 about three times so far). Hoping that OST 3 is a step above both. And yeah, ambient stuff is good if you’re looking for stuff that won’t be distracting when your mind is occupied elsewhere. Yeah, it’s not bad, which is why I gave it a “Decent” score. If there’s a lot of me being disgruntled, it’d be because I expected a lot more out of Senju because up until now, he’s had a very good run as far as his compositions go. Personally, I rather enjoyed most of this soundtrack. I’m not familiar with any of Senju’s previous works, but I do know that he’s a rather acclaimed composer with a great deal of skill and talent. The way these tracks were used in the series was atrocious, in my opinion. @macattuck pretty much summed up what I was thinking. Personally, I think that the score alone, looking at it by itself and not trying to click it with scenes of the anime or comparing it to other scores, is fantastic. All three discs have their let-downs and not-so-great pieces, but as a whole, its very good. I myself am a huge fan of the more emotional pieces, such as “Trisha’s Lullaby” and “One is All, All is One”. The Latin lyrics and strings just kinda got me. I don’t pretend to know anything about music theory or anything. When I play/listen to music, I just kinda think about where the music itself is going to take me. The Brotherhood OST was gorgeous and a couple of tracks even drove me to tears (or close to it) at some points. Definitely acclaimed and talented. I’ve enjoyed a large swath of his work out there that this one seems a bit out of place in my opinion. I also see where you’re coming from, and the aspect that you cited does explain why I’m not too fond of it as an entity; to find good tracks, you’ll almost have to pick and choose because the good tracks are really good, emanating a lot of emotions that are so heartfelt to listen to. But the tracks that are dull are horribly dull. It’s his most inconsistent soundtrack to date if you ask me. I don’t think we disagree actually since the work that Michiru Ooshima put into the original was just fantastic. Your noting of the lack of emotion matches my sentiments and I was expecting better from Senju, who has a good record with J-dramas. So yeah, I definitely feel your disappointment. Personally I liked the music a lot, but I can definitely see where you’re coming from with your analysis. I like fanfare of the brave, but definitely see how the lack of a real climax hurts it. This OST is one of those where I have my favorite tracks and then ignore most of the rest because there isn’t really anything that grabs my attention. I don’t know whether I mentioned this or not, but the lack of cohesion really hurts this soundtrack as a whole and I feel that it resembles more a series of musical cues than a grand attempt at storytelling through music. Contrast that with Fairy Tail’s soundtrack where you’ve got a rock+balladic stuff going on to make for a wonderful epic and you can see where FMA:B falls woefully short.